A lovely new interview with Geoffrey Winthrop-Young has been posted online: “More things in theory than heaven and earth are dreaming of.” Conducted by Melle Kromhout and Peter McMurray, it brings out great points. Winthrop-Young is always a pleasure to read, both because of the tone and the insights. Of course, in this case I remain biased, with the focus of the interview being about the so-called German media theory (which is not, as we are reminded, not so German, not pretending to present a big theory nor is it really merely German), Bernhard Siegert, cultural techniques and by the end, also about “media biology”. What’s not to like. GWY has a fantastic sense of explication when it comes to media theory. When he responds about the subject topic of the interview that “cultural techniques are further installation of modern theory’s crusade against the as such” it both gives a subtle sense of how it maps as part of the contemporary theory landscape (and the persisting enthusiasm for the ontological as suchs) and also reminds me why I feel attracted to cultural techniques and related media analytical directions; I am, after all, a slowly recovering (cultural) historian who does not mind that the notions we operate by, the cultural layers, “all the levels all the way down are made up of historically locatable practices” even if with various twists of complex feedback loops. I am pleased to announce that I have signed a contract with University of Minnesota Press for a new book tentatively called A Geology of Media. Planned for 2015, A Geology of Media forms the third, final part of the media ecology-trilogy. It started with Digital Contagions: A Media Archaeology of Computer Viruses (2007) and continued with Insect Media (2010). This book on the geophysics and the non-organic ground of media complements the earlier takes by offering a media materialism from the point of view of geological resources, electronic waste and media arts. 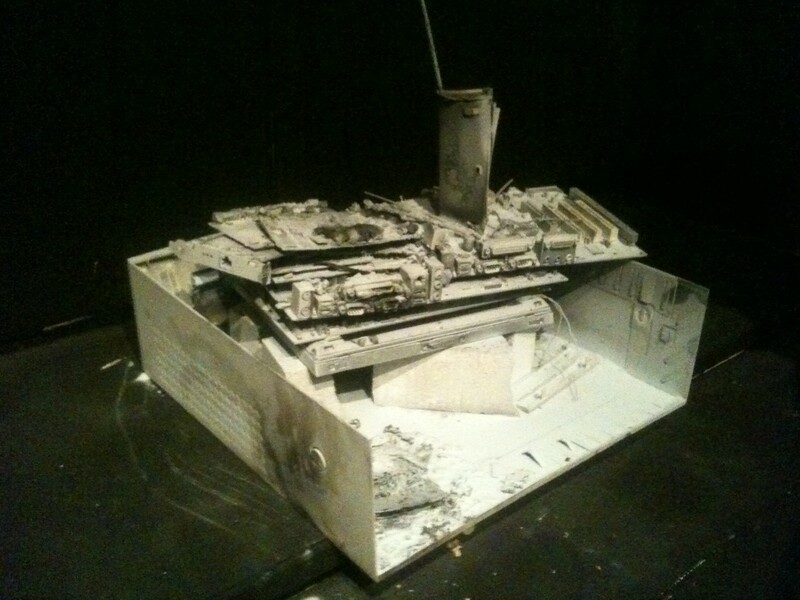 Through engaging with several contemporary art and technology projects it provides a media theoretical argument: to think of materiality of media beyond the focus on machines and technologies by focusing on what they consist of: the chemistry and geological materials of media, from metals to dust. In short, I am interested to see if what pejoratively sometimes is called “hardware fetishism” is not hard enough, and even media and cultural theorists need to focus on the rocks and crust that make technical media possible. Earth history of deep times mixes with media history, which becomes a matter of not only thousands, but millions of years of non-linear history (to modify Manuel Delanda’s original idea). This way media materialism becomes a way to entangle media technologies, environmental issues and themes of global labour. Perhaps instead of the Anthropocene, we should just refer to the Anthropobscene. I’ve been in recent talks and short posts been addressing the geological in media, and my piece in The Atlantic offered a short preview of what’s to come. In addition, below a very tentative table of contents. This project (and the Erkki Kurenniemi book I am working on with Joasia Krysa) will keep me busy for a while. “Yes I will” – “No, it is not something worthwhile”. I’ve been going back and forth for a while whether I will try to expand my ideas concerning “geology of media” into some sort of a book or not. Without having reached a conclusion, I have however been giving talks on the topic the past times. Here is one – as video – from Bochum from the very good General Ecology-event Erich Horl organised. I want to pick up on Siegfried Zielinski’s notion of deep time of the media — not straightforwardly media archaeological, but an anarchaeological call for methodology of deep time research into technical means of hearing and seeing. In Zielinski’s vision, which poetically borrows from Stephen Jay Gould’s paleontological epistemology at least in its vision, the superficiality of media cultural temporality is exposed with antecedents, hidden ideas, false but inspiring paths of earlier experimenters from Empedocles to Athanius Kircher, Johann Wilhelm Ritter to Cesare Lombroso. Zielinski’s excavations are not content to stay within the regime of media archaeology, but want to uncover a non-linear layering of variations. Indeed, in a manner that seems to be borrowing from a Deleuze-Guattarian ontology of nomadism and the primacy of variation (I don’t however think that Z makes the link to DG explicit), Zielinski’s methodology is in this sense a refusal of any master plans of media development and a plea against both the drive towards psychopathia medialis (the standardization and uniformity as well as illusions of teleology). Instead, the paleontological conceptualisation of a media history of variations finds surprising case studies of aberrants paths for hearing and seeing, of optics and acoustics, of technical means of guiding, misguiding, educating and mocking the senses. And yet, as an alternative deep time, I suggest that instead of male heroes, we approach a more geologically tuned deep time – deep in various senses, down to mineral excavation, and picking up some themes of media ecological sort. I want to speculate with a more geologically oriented notion of depth of media that is interested in truly deep times – of thousands, millions, billions of years and in depth of the earth; A media excavation into the mineral and raw material basis of technological development, through which to present some media historical arguments as to how one might adopt a material perspective in terms of ecological temporality. For instance for the European Union, the future of information technology has to be planned starting from a material level up: The EU does not hold much in terms of critical raw material resources when it comes to advanced technology that are identified crucial for a longer term socio-economic change. Obviously, such issues are always voiced with a concern for the geopolitical-economic consequences. In short, this refers to the crucial status of China, Russia, Brazil, Congo and for instance South-Africa as producers of raw materials, and an alternative material future of technological culture. This connects to a realisation: the materiality of information technology starts from the soil, and underground – 500 meters, and preferably (for the mining companies) lower as the earth’s crust is dozens of kilometres deep. From animals to nature as a resource, a material ecology for media is an increasingly important topic. This is the double bind that relates media technologies to ecological issues; on the one hand, acting as raw material for the actual hardware, from cables to cell phones; on the other hand, as an important epistemological framework whether in relation to mapping of climate change or in terms of further resources for exploitation, as in the recent proposal not just for Internet of Things – but Internet of Underwater Things. Perhaps an alternative sort of a deep time of the media is needed – one that does not excavate deep times of human inventions, successful or just imagined, but deep times of animal and geological sort, and the cultural techniques that are affiliated with such non-human regimes? This could be a further advance to consolidate the work of media ecology and zootechnics (cf. Sebastian Vehlken’s recent work in this area, as well as Insect Media). European Union Critical Raw Materials Analysis, By the European Commission Raw Materials Supply Group, July 30, 2010. Executive Summary by Swiss Metal Assets, October 1, 2011, under www.swissmetalassets.com (24.7.2012).